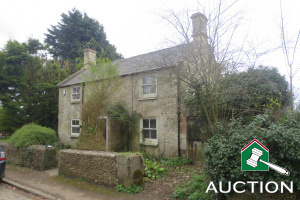 Country Property were in full flow again this month with an outstanding auction sale of Park Cottage, Hawkesbury Upton. Chipping Sodbury Town Hall auction venue was packed with interested parties, and after a cautious start by bidders, the bidding rose steadily through £250,000 to £285,000 with several bidders, until auctioneer Nick Cragg finally brought his gavel down after the final two bidders battled it out to a closing bid of £302,500.. The room erupted into a hubub of conversation, and the vendor and his group of supporters were delighted with the outcome. Nick afterwards remarked this was a classic auction property with stacks of potential, and auction not only secured the best price for the owner, but also maintained transparency and certainty for the buyer - who was equally delighted!